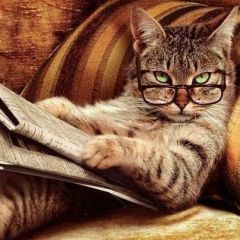 I think a few people in the community know about this, but in my parallel life here in London, among many other things, I am a pet sitter. It is always great to take a break from my desk, go offline, and visit a pet or two, making them company while their owners are typically on holidays. I also enjoy it because, in addition to be an animal lover, it takes me to places in London where I would never think of going – or, in the case of this Tuesday, places that I would not go again if I didn't have a reason to. Yesterday the weather was so good that, knowing these might be the last legs of summer in the UK, I decided to walk all the way from Limehouse, where I am currently based, to Devons Road, where the cats I had to visit live, by the Limehouse Cut. I stopped at the post office on the way to collect a packet and found there old pictures of the area, I just love old pictures of London. The city has changed dramatically in only a few decades, I thought. So have I, I think. And I carried on walking, it was a new path for me: for the first time I placed my footsteps on this way, despite having lived in both, Limehouse and Bow, in a distant decade past. An inaccurate map of my walk, as my phone died half way. I learnt how to track my footsteps using my phone in Rezwan's blog, linked here. I used the 20ish minute walk to think a lot about GV, its past and future, what are the next steps for me, and everything I had on my to-do list, awaiting for me on my return to my desk. In between thoughts, I looked at new buildings, people's face, the canal and its narrow boats, I imagined what it is like to live in one of those flats or what goes on inside those seemingly abandoned warehouses. As I looked at the bridges, I touched the ground underneath, I felt gratitude – forgetting occasionally about work and anchoring myself to the present. I then arrived at my destination, fed two lovely cats, cleaned their litter tray, gave each of them a good grooming session, offered treats, played a bit, looked out at the balcony and then it was time to come back. Or perhaps not, I wondered? It was still a glorious end of day, and I had my explorer vein activated. Do I really need to follow the script each time? When this question pops in my mind, invariably the answer is ‘no’. I rebel to plans and give way to the unexpected, the magic, the moment. This is where the title of this post starts to make sense! On leaving the building, I realised that those two “new” towers out there were actually the old block of council flats in Bow where I lived from circa end 2002 to mid 2004. I had been looking forward to revisiting them since I heard that they had gone through a £100 million regeneration, but never found the time. So many memories – good, bad, sweet and sour – of a very crucial time in my life: my first two years as a Brazilian immigrant (even though I had lived in three other places in the first six months alone! ), in the heart of the cockney area of the East End of London. And as it was the last day I was looking after these cats, I decided to change my destination and instead of heading straight back to my desk at Limehouse, I went to have a look around. Carrying a mobile phone with a flat battery in my pocket, with no map or plan, I found myself meandering the streets and estates of Bromley-by-Bow, guided by the sight of those towers. Then life throws yet something else on your way. As I walked down Powis Road, I saw a house whose blue plaque called my attention. On this occasion, I chose the second option and found out that the Grade II listed building housed a community centre called Kingsley Hall and, as I looked around, something else caught my eyes: a colourful banner advertised the 3 Bees Cafe, selling affordable, vegetarian, wholesome food and only open on Tuesdays from 4pm to 7pm. Hungry I was not, but curious I am always. This coupled with the fact that I was in the right place at the right time was enough to instigate me to go inside. 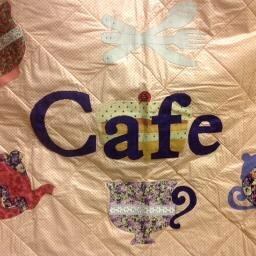 Hi everyone 3 bees cafe open today 4-7 there will also be vintage clothing and a patchwork stall in cafe. As a lover of the annual Goodwood Vintage Revival Meeting (an annual event at Goodwood Motor Circuit. when classic cars are raced and most people wear vintage clothes). I pledged a year ago to make my own vintage outfit to wear this year. This meant learning to sew! However, my love of 1950's style overruled my common sense. As attempting a 1950's original Vogue dress pattern was rather ambitious to say the least! I enrolled in a local sewing class. With great perseverance I achieved my goal. Unfortunately it rained so heavily this year that I never got to wear it! I then went to have a chat with Sharon. Asking if I lived nearby, she discovered I was a pet sitter, and as a dog owner herself we connected immediately. By an incredible coincidence, Sharon lived in one the towers I was seeking – when I told her I had never been around since I moved out, roughly 10 years ago, she said I would not recognise the place. Sharon prefers the way it was before, surrounded by green where now there are flats and more flats. I didn't wait for the event in the evening I was invited by her, for I went to see the new Priestman Point. I indeed did not recognise the place, and hope to be back in the area, perhaps next time as a dog sitter, to re-explore it and make more of these human connections. I learnt so much history and soul-making from attending to the unexpected of a Tuesday afternoon, and back home the exploration continued at my desk. I discovered more amazing things about this pioneering east end community centre: it was founded by peace campaigners Muriel and Doris Lester. 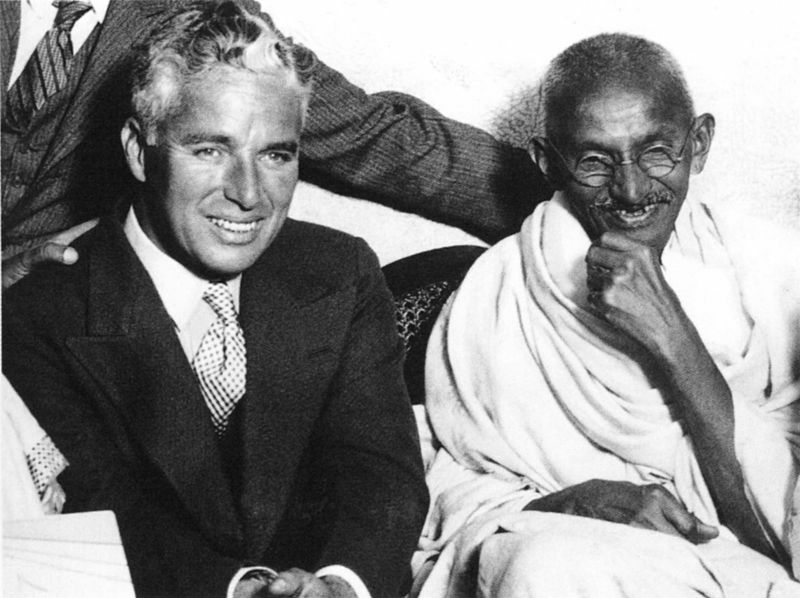 Peace activist Mohandas Gandhi lived for 3 months when he visited London in October 1931, to press for the independence of India – and where he unexpectedly received an invitation to meet another great man of the times who he had never heard about: Charles Chaplin. 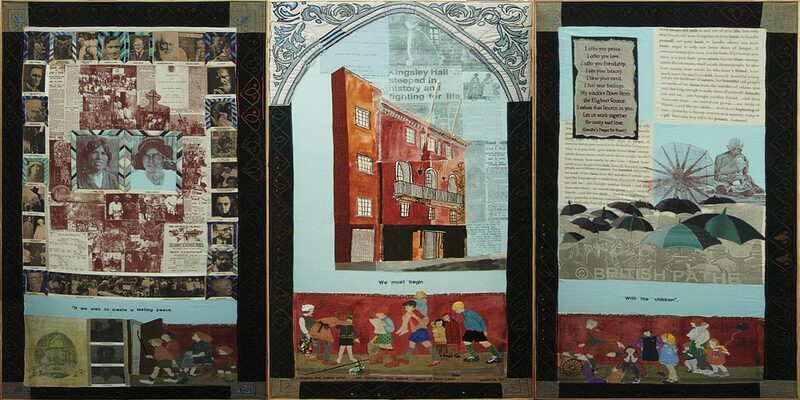 In addition to this, Kingsley Hall had been shelter and soup kitchen for workers during the 1926 general strike in the United Kingdom; the centre also has strong links with the Suffragettes Movement in East London; and operated as a community place for educational, social and recreational purposes during war times; on the top of it all, in the 60's, it was home to one of the most radical experiments in psychology, a community of “schizophrenic people” living together in “a melting pot, a crucible in which many, assumptions about normal-abnormal, conformist-deviant, sane-crazy experience and behaviour were dissolved. No person gave another tranquilisers or sedatives. Behaviour was feasible which would have been intolerable elsewhere. It was a place where people could be together and let each other be”. 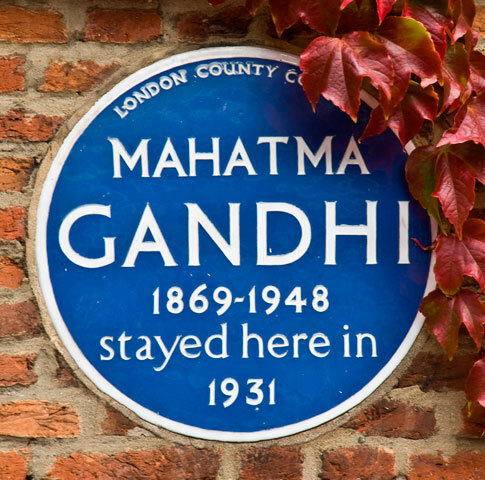 The new building at Powis Rd, London, E3 3HJ (1928) has a main hall, a mini hall gardens, Gandhi's room and rooftop terrace and garden and houses the Gandhi Foundation – I didn't visit any of these yesterday, an excuse to go back to this place. I think it is a place for connection – past and present, inner and outer – that I will appreciate more with my new awareness, and new friends. Published in the defunct http://www.kingsleyhall.co.uk/ with anti ©opyright – information for action copy and distribute! This post is about connection, and just an excuse so that I can nominate three more GVers to our GV Blog Challenge – three people who I loved working with and still feel the loss, for we have disconnected since they left GV: David Sasaki, Daniel Duende and Melissa De León. What a lovely write-up, Paula! Discovering such gems that stay “hidden” from us because we are too busy to stop and smell the roses, is truly heart-warming. Look forward to reading more of your discoveries. Thanks, Aparna. I could write a post a day with what my pet sitting life brings my way ;) It was a lovely afternoon. I am glad you enjoyed it! Discovery literature :) Loved the post!